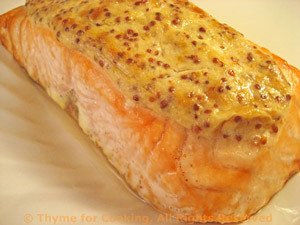 Baked Salmon with Horseradish, Thyme for Cooking easy gourmet main course. We use fillets but salmon steaks will work as well; add another 5 - 10 minutes for steaks. The mild heat of the horseradish and mustard works well with the sweet salmon. Mix all of the above (except salmon). Put salmon on a lightly oiled baking sheet. Divide mixture evenly and spread over salmon. Bake at 400 F for 15 - 17 minutes, until top is light brown and fish flakes easily.